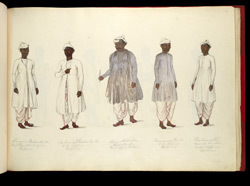 Opaque watercolour of five clerks in the Fort Adjutant's Office in Vellore, Tamil Nadu. Vellore is situated 129 km west from Madras. The town is famous for its sixteenth century old Vijayanagara fort and for the Jalakanteshvara temple. Inscribed on the watercolour: 'Armogum Pension Writer, Fort Adjutant's Office, Vellore';' Soobroyloo Pension Writer, F.A. Office, Vellore';' Appoo Moodelien, Head Writer, F.A. Office, Vellore';' Veerasawmy Writer, F.A. Office, Vellore';' Verdamally, Family Writer, F.A. 's Office, Vellore.' The adjutant was responsible for direction of all the organisational matters for sections of the army. The chief clerk answered to the adjutant for the paperwork and for administrative purposes.